Karin & Elvis had planned a surprise for us on Friday night. We had an early dinner and had to leave for the train station by 6.45pm. We got off the train and saw all these people in Swiss hats, scarves etc… so thought we must be going to some sort of sport’s event. When we got closer to the stadium they told us we were going to see the Swiss Football team play Jamaica in a friendly match as part of the Swiss teams build up for the World Cup being held in South America from mid June. 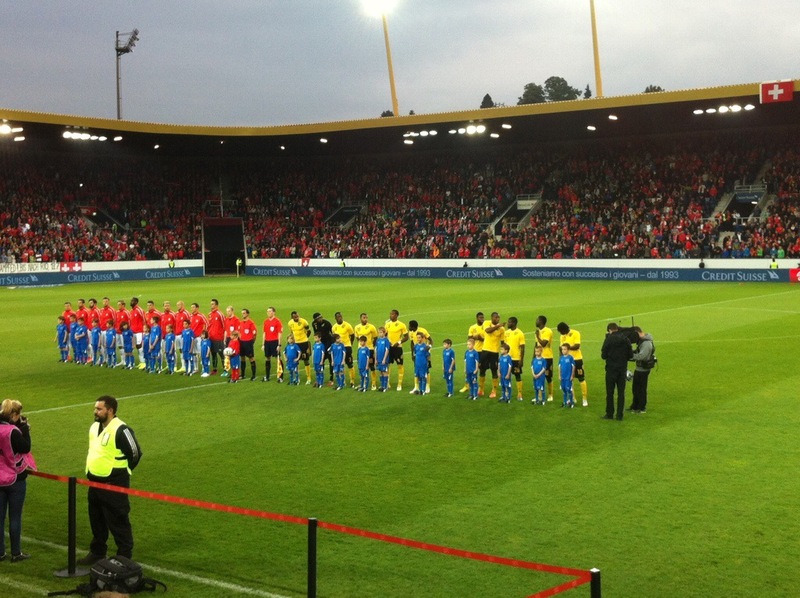 The stadium holds 16,800 and there were 15,000 spectators for the game. We had these great seats 3 rows from the front and just along from the players and managers area. At half time we had to sample the Swiss sausages – I am not a sausage fan but I love Swiss sausages and mustard! 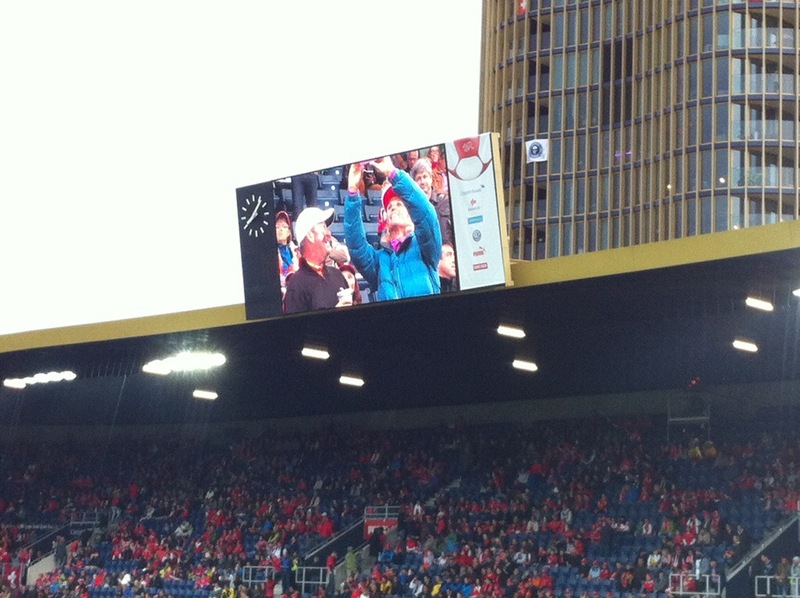 I also had a Kaffe Fertig which is coffee with schnapps – another Swiss tradition when attending a football match. Switzerland won the game 1 nil so the crowd was happy. Switzerland is ranked number 8 in the world and Jamaica is ranked number 82 in the world. 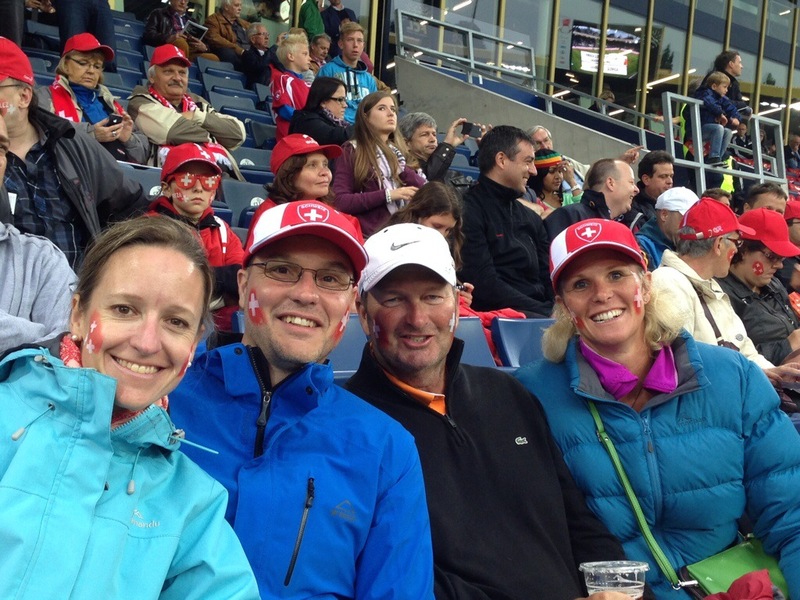 A fun night had by all and an unexpected bonus on our trip to Switzerland. We even managed to get on the big screen – I took a photo of us up on the big screen – a new form of selfie – taking a photo of yourself taking a photo while on the big screen!